Maybe I could lie to Sportacus, saying there is trouble in a place that doesn't exist far far away, so he can go there and take years to arrive, muahahahhaa. 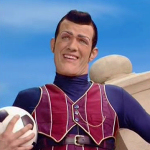 Of course just if I was Robbie Rotten . "Hey Sportakook! There's trouble in BullyTown!" Would feign a radical personality change, position myself as Sportacus's sidekick, and foil enough of his edeavors to tilt the scales in my favor. Everybody needs a little time to play around. Have to heat it up, better burn it up. Cool it down. No one can juge about what are you doing. I would get sporta-chicken-scratch to have a sugar meltdown, put him in a cannon, and shoot him out of town FOREVER! I would use my cannon to blow up his airship. Well, since the answer would have to be PG, I'd just pull a Team Rocket and dig a huge hole that Sportaflop would jump right into and then cover it and patch it good as new. He'd never escape and I'd be free to rule lazytown. I would go with what Chris (Stingy) said. If I were Robbie I would report his airship to the civil aviation authority as a danger to navigation. After all what gas is it filled with? It is unlikely to be helium, as that is very expensive and in short supply (it can only be found from natural sources, it cannot be manufactured) therefore it is most likely to be hydrogen. As Sportakook never smokes that would be no problem to him. 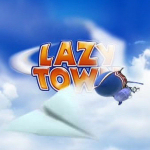 This makes that blimp of his a fire hazard, if it was to crash into lazy town, the result would be total carnage. After all he nearly crashed into the Mayor's house once, well OK maybe I may have had something to do with that. But anyway I would have the CAA ban him from passing within 50 miles of any inhabited areas. OK he still has that sky bike thingy, but if he has to pedal that fifty miles every time he comes into lazy town, that should cramp his style somwhat. Also just to be nasty I would have his mustach banned, I mean... That silly pointy thing he's going to have someone's eye out with that. So I would have all mistake wax banned from lazy town, that would leave it all loose and floppy and it would tickle he's nose when he does those flip flop thingys. This makes that blimp of his a fire hazard, the result would be total carnage. Wow very impressive fireball. But I don't think Robbie would go that far, he just wants Spartacus to leave FOREVER! If he did do something like this he might get into real trouble. I have just watched the series two episode "friends for ever". In this episode Spartacus says that his airship is filled with air. So it could never explode, it must be hot air or it could never fly either. I wouldn't even question what the thing's filled with for how many other aerodynamical principles it violates. Have you ever seen a supersonic propeller-driven blimp before? Also I never thought about it before, but it's like they predicted the Amazon Alexa with the airship's AI roughly a decade beforehand.